Very clear and calm day. Just the odd bit of very high-level cloud around, also a slight haze in the sky.Took the Solarscope out to do a quick sunspot count. Area 892 looked a little less detailed when compared to yesterday with only 8 spots visible. Area 893 also looked a little less complex too with just 2 spots visible (compared to yesterday's 3). Mostly clear night with some thin cloud around (I could, for example, see a pretty nice halo around the Moon). The sky was still very light but given that Jupiter was in a position where I could see it from my back garden I decided to have a quick session looking at it with the 905. I got Jupiter lined up in the 905 using a low-power eyepiece and then I dropped in the 6mm eyepiece. 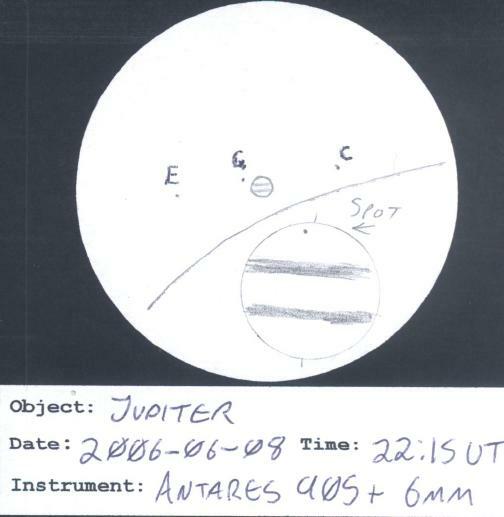 Initially the image was pretty poor, moving around quite a bit and the visible detail was much less than previous views of the planet with the same equipment. That said, the 'scope hadn't had any chance to cool down. As usual the two main bands were easily visible and there was obvious variation on the rest of the disc. I could only make out three moons (later checking showed them to be Europa, Ganymede and Callisto). Europa and Callisto were some distance out, either side of the planet while Ganymede was quite close to the planet. Around 21:58 UT, in very steady moments (the image was rapidly getting better), I started to notice a very clear, sharp, dark spot near the north pole of Jupiter. My initial impression was that I was seeing a shadow of one of the moons (presumably the Ganymede). To be sure that this wasn't just an artifact I tried changing eyes, rotating the eyepiece and shifting the 'scope about to place the planet in a different part of the field of view. Nothing I did changed the image. After watching this a bit more I grabbed my sketching box and, between 22:10 UT and 22:15 UT, I made the following rough sketch so that I could compare the view I had with some other source later. After doing the sketch I popped into the office and fired up Starry Night to check what I was seeing. It confirmed that I was seeing a shadow and that it was the shadow of Ganymede. My first ever Jovian shadow transit! Around 22:30 UT some thin cloud moved in such that my view of Jupiter got a lot worse. The amount of visible detail was reduced and I could no longer see the shadow. By 22:39 UT the cloud was still hanging around and the image had deteriorated even more. I also noticed that the air suddenly felt quite damp and that a thin layer of dew was forming on everything. By 22:50 UT the cloud had finally cleared and the view of Jupiter had improved again (although it didn't seem to be as crisp as it had earlier on) but I still couldn't make out the shadow any more. At 22:55 UT, given that I still couldn't make out the shadow and that I needed to get to bed soon, I called it a night on the session. 21:18 UT Ganymede's shadow begins to cross Jupiter. 23:08 UT Ganymede's shadow leaves Jupiter's disk. This would explain why I was unable to see the shadow towards the end of the session: it would have been very close to the edge of the planet's disc and I would probably have been unable to resolve it that close with the equipment I was using.